I am not a crafter. I am a do it yourself-er when it comes to home renovations and repairs, but not a crafter. My mom is a great craft maker, but almost every craft I try has a 50/50 chance between Doom and Halfway Decent. But somehow, in the last week, we have been on a crafting frenzy. First, we actually did the wax leaf craft I posted on about a month ago. We wrapped up in our sweaters early one morning when rain was threatening and loaded into the double stroller to walk the neighborhood and pilfer pretty leaves from other people’s yards. We do not have a single tree that produces autumnal beauty in our own yard. Thankfully, no one set their dogs on us and we stayed right next to the road to pick some colorful leaves off the ground. That’s not exactly stealing, is it? Our garland was pretty, but it didn’t stay pretty for long before it turned brownish. I’m not sure where we went wrong because it was supposed to last forever. But it was still fun and pretty for a couple of days. So that craft falls into the Halfway Decent result category. Then yesterday we went hog wild. 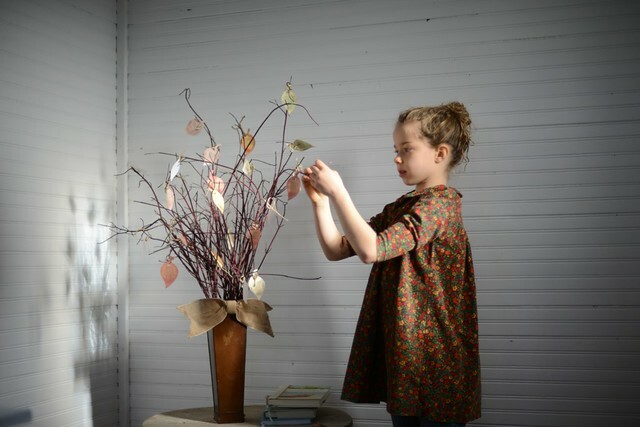 My friend Megan gave me a good idea for a variation of this gorgeous Thanksgiving tree featured on Ann Voskamp’s blog. Our craft is a little more tiny people friendly and not nearly as lovely. Well, you know what, I think it is as lovely because when I asked my little girl what she was thankful for, she said, “I’m thankful that Jesus took away our sins and I’m thankful that Ryland is in heaven.” It was encouraging to know that what comes to her mind when she thinks of something to be thankful for are the things we try to focus on. We’ll add some thanksgiving leaves to it until Thanksgiving Day. I felt pretty pleased with getting one craft done, but that was only the beginning. While the kids were napping, I spray painted some black dollar store frames and built on the craft we did at MOPS last week. I now have sort of matching dry erase menu and cleaning schedule boards. Also Halfway Decent. I was on a roll. But then I went for Mother Of The Year Award and made homemade play dough. Pink homemade play dough. It was a hit. And very easy! I followed the tutorial on Musings From A Stay At Home Mom. We also made some blue play dough for Isaac. I would go so far to as to say that this craft actually went beyond Halfway Decent and turned out Great. Maybe my crafting curse is over! Now, if I could just get rid of my Cake Curse and Black Thumb. Because if you’re really going to win Mother of The Year, you have to fill your home with healthful houseplants (living, preferably) and make gorgeous birthday cakes. Wow! You have been crafty! I have a menu board too. I can’t imagine life without it. I’ve been inspired and motivated! With a foot of snow on the ground (and the snow still coming down, today might be a good day to get my crafting hat on).